What do you get when you mix poetry, flash mob, traditional and modern midrash and commentary with a bit of singing thrown in for good measure? That is the essence of a new endeavor by Cantors Abbe Lyons and Michal Rubin and Rabbi Melissa Starr Wenig. A featured class at Kallah this July, Speak-Chorus Torah is a collaborative creative process of delving deep into the sacred words of Torah leading to an amazing presentation that draws in all who listen.“Speak Chorus grabs your attention and holds you to the point that you truly receive the message of the Torah for the eternal moment,” says Rabbi Victor Gross. First experienced at Ohalah and then at Ruach Ha’Aretz, this participatory method of re-Searching and re-Telling Torah’s tales has received high acclaim by both speakers and listeners. “Being in a creative process around text helps me understand kinesthetically what my intellect cannot receive,” expressed one participant. Lyons, Rubin and Starr-Wenig plan to bring The Speak-ChorusTorah Project to educators, synagogues and retreat centers through experiential workshops and training programs. At the ALEPH Ordination Program’s smicha (ordination) ceremonies, each new colleague has the opportunity to give a D’var Torah, usually somehow related to the weekly Torah portion, which is often VaEra or Bo, the two portions which between them relate the 10 plagues and the Israelites’ flight out of Egypt. When the ALEPH Class of 5770 (2010), 8 rabbis and 2 cantors, first met to discuss this momentous rite of passage, we began to consider something a bit out of the ordinary: instead of each individual giving a D’var Torah, creating something as a group. Jan Salzman introduced us to the Speak-Chorus format developed by Vermont educator Harriet Worrell, who took her inspiration from the Chorus in Greek dramas to bring historical events alive in a unique performance style using spoken word and music. Six of us built on Harriet’s work to create a collaborative midrash. Through studying together and separately, writing poetry and prose, discussing, editing, adding music, reading aloud, rehearsing and refining over many weeks we created the first SpeakChorus Torah, which we presented at our smicha ceremony. The three of us (Michal, Melissa and Abbe) loved this process so much that we began to do it with other groups. Abbe facilitated a SpeakChorus on Jonah for Yom Kippur afternoon, the script of which was later adapted and presented by a different group at Or Shalom in Vancouver. We were then invited to create a SpeakChorus on parshat Balak at Ruach HaAretz, to be presented at the Shabbat morning service. We developed the process to work within a one-week time frame bringing together our diverse experiences with melody, writing, Torah study, meditation, movement and community building. 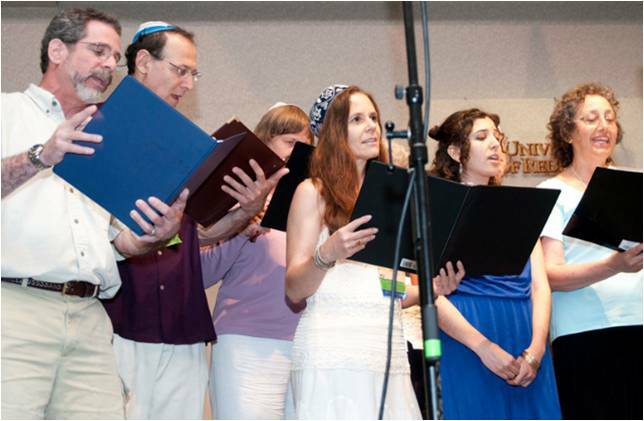 What is most amazing about SpeakChorus Torah is the way each person’s voice is both separate and a part of the group. The script includes each participant’s words as well as non-verbal insights elicited by the exercises & discussions. The whole is truly greater than the sum of the parts, and the congregation becomes part of that greater whole as we all experience it together. SpeakChorus torah is one more reason you don’t want to miss this summer’s Kallah in Rindge, New Hampshire! Posted in ALEPH Kallah, General Interest, Learning Opportunties and tagged aleph alliance, aleph kallah, Kallah, speak chorus, torah study. Bookmark the permalink.